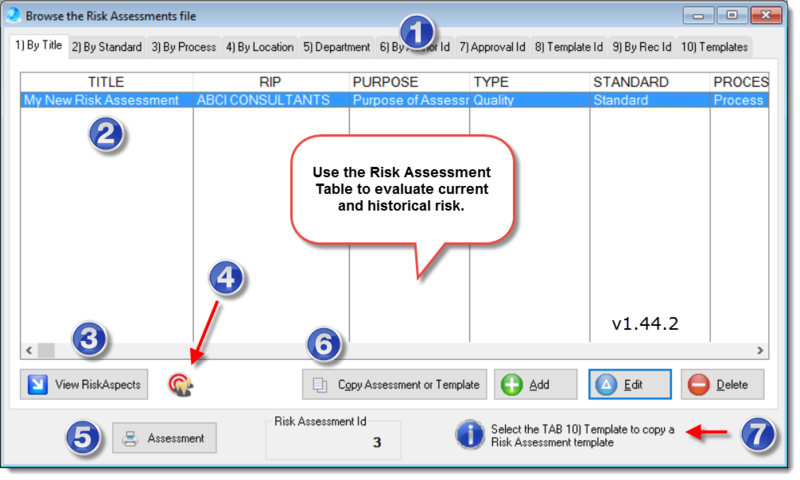 The Risk Assessments browse table can store a large number of current and/or historical assessments. 1)The browse window contains sort tabs for instant viewing of data according to the key value of the Tab. 2)Risk assessments can be performed and recorded for virtually any type of risk related to the organization, relevant interested parties, product, service, staff, logistics, transportation, and cost, including environmental, health and safety. 3)View RiskAspects button: Opens a sub-table of related aspects to the highlighted risk assessment may be viewed, added, edited or deleted as needed. 4)RIP icon button: Access the Relevant Interested Parties table (RIP). 5)Print Assessment button: Use the button to print a Risk Assessment, which includes all aspects and impacts recorded. 6)Copy Assessment or Template button: The copy button control copies the currently highlight assessment record. 7)The tab 10) Templates applies a filter that only shows the Risk Assessments designed to be templates.